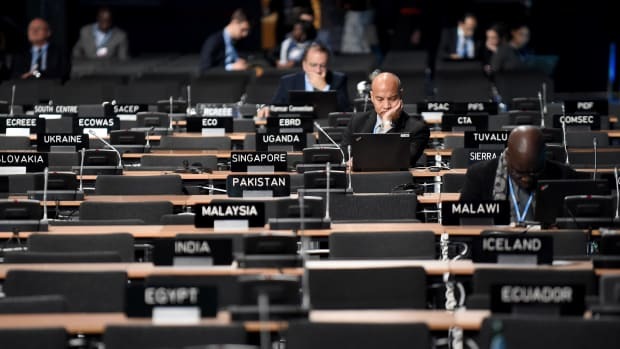 Taking stock after the first week of the 2018 United Nations climate summit in Katowice, Poland. The United Nations Secretary-General Antonio Guterres attends a session at the COP24 summit on climate change in Katowice, Poland, on December 4th, 2018. If you couldn&apos;t make it to Katowice, Poland, this week to follow along with the United Nations climate talks, first of all, count yourself lucky: The temperatures and the air quality in the city have been falling all week. On Monday, the World Bank Group announced plans to increase its climate funding for developing nations to $200 billion over a five-year period. This sum roughly doubles the institution&apos;s current funding for climate change, which World Bank President Jim Yong Kim called an "existential threat to the world’s poorest and most vulnerable," in a statement earlier this week. "We are pushing ourselves to do more and to go faster on climate and we call on the global community to do the same," he said. "This is about putting countries and communities in charge of building a safer, more climate-resilient future." Half of the new funds—provided by the World Bank, the International Finance Corporation, and the Multilateral Investment Guarantee Agency—will go toward adaptation. It&apos;s something of a landmark among international initiatives in allocating equal sums to adaptation and mitigation. Civil society observers are hopeful that this could be a sign of future finance flows. "The world&apos;s best scientists have made clear that climate impacts are coming faster and sooner than we thought, but financing has not caught up with the science," the World Wildlife Fund&apos;s Margaret Kuhlow said in a statement. "This is the type of signal that could catalyze further investments to help countries transition their economies and adapt to worsening climate impacts." On day three, Canada delivered. Without going into specifics, Environmental Minister Catherine McKenna said that the country acknowledges its needs to up its climate targets in the next two years. The most recent report from the Intergovernmental Panel on Climate Change found that the world needs to halve its emissions by 2030; Canada&apos;s current target is a 27 percent reduction. The private sector, meanwhile, appears to be responding to calls for more action. The Danish shipping titan A.P Moller Maersk and the United States-based utilities company Xcel Energy both announced plans this week to be carbon-neutral by 2050. 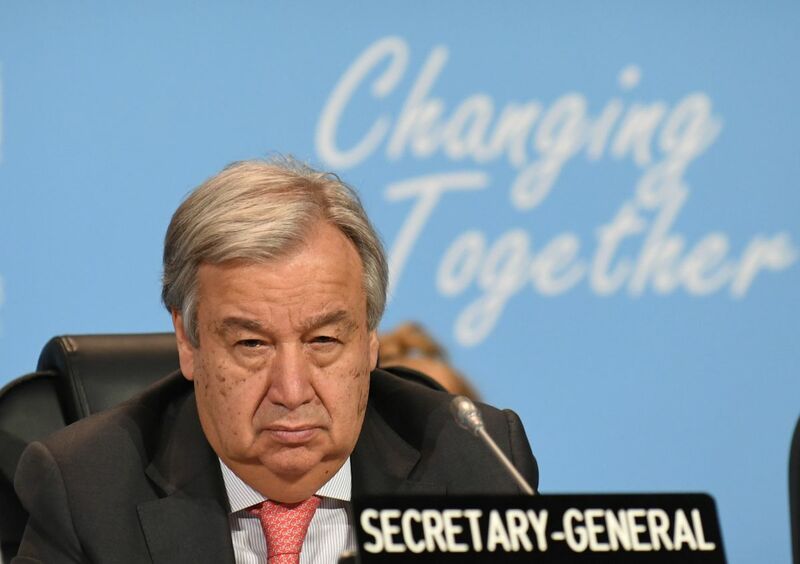 U.N. Secretary-General António Guterres will give the rest of the world a second shot to step up at a U.N. climate summit next September focused on helping countries raise ambition. 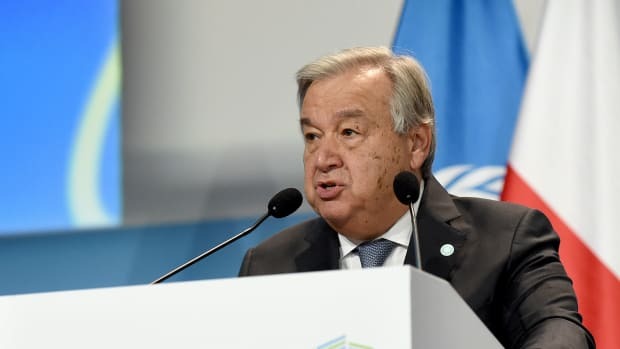 "I invite all governments, businesses, sources of finance—public and private—and civil society organizations to join in the preparatory process to raise real ambition and transform the real economy," Guterres said in a press conference announcing the summit, which will also give youth climate advocates more of a platform. "We need to harness their energy, invention, and political power to raise climate ambition," he said. Nearly everyone at COP24 agrees that coal needs to be phased out as soon as possible if we&apos;re going to meet the goals of the Paris Agreement. 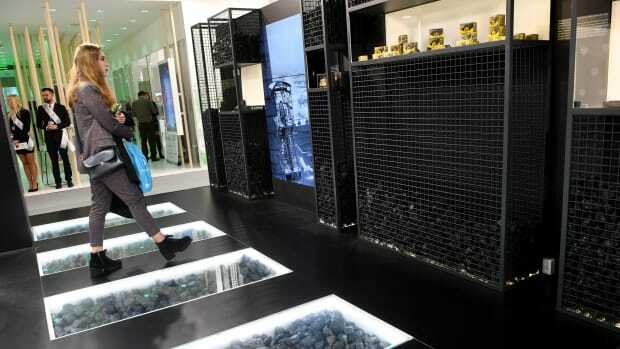 While the Polish coal sector has been shrinking for decades, there are still tens of thousands of people employed in the industry—most of them in the Silesia region, where the conference is currently taking place. That&apos;s why the Polish government introduced the Silesia Declaration on Solidarity and Just Transition early this week, a document that calls on governments to protect the rights and well-being of workers and their communities as economies transition away from fossil fuels. Oskar Kulik, a climate and energy policy officer at the World Wildlife Fund in Poland, said he wouldn&apos;t go so far as to call the declaration "empty words," but that "right now, the Polish government is not really proactively working on the just transition of this region." Kulik says that the current government in Poland, like past administrations, has assured the Silesia region that the coal industry will continue to thrive, despite increasing costs and climate concerns. "The result is we have no real plan on what to do in the situation of declining coal consumption and extraction," Kulik says. 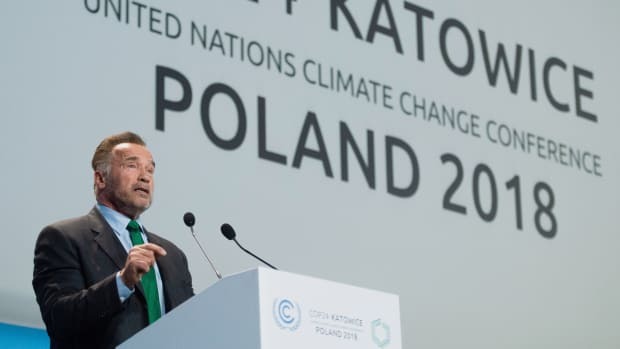 Case in point: The Polish President Andrzej Duda said earlier this week that "using coal is not in contradiction with climate protection in Poland because we can lower the emissions and ensure economic growth at the same time." Later, during a press conference, Duda rejected the idea of phasing out coal in the country: "There is no strategy of total phase-out of coal in Poland today. This is our strategic resource, so it&apos;s hard for us to give up on it. We have supplies for 200 years, and it would be difficult for us to give up coal, thanks to which we have energy sovereignty." 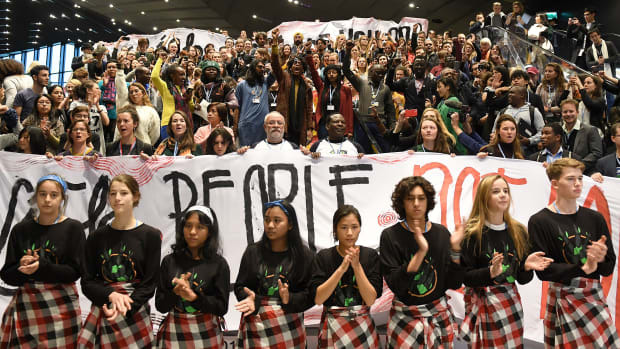 Climate advocates pointed to France this week as a warning of what can happen when climate policies don&apos;t include social protections for the vulnerable or poor. Protests there over a gas tax turned violent, and French President Emmanuel Macron&apos;s administration said on Tuesday that it would suspend the tax hike for six months. 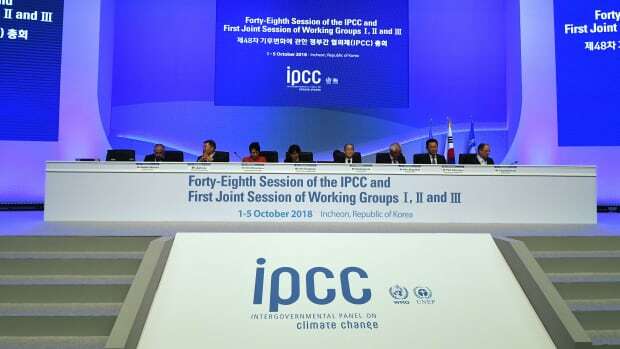 Lucile Dufour, with Climate Action Network France, said at a COP24 press conference that "just transition and ambition are two sides of the same coin," and that limiting warming to 1.5 degrees Celsius "will only be possible if conditions are made to take everyone onboard in a just and fair manner."